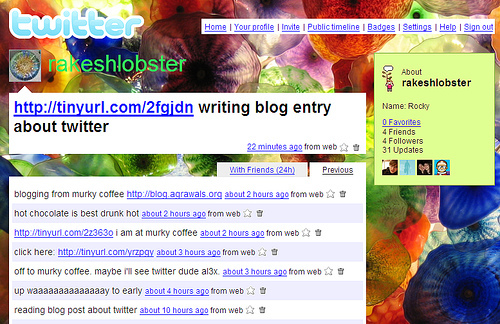 I’ve been writing about Twitter and location since my first post about Twitter in 2007. This week, Twitter launched Places, which allows users to add their location to a tweet. With the launch of Twitter Places, the search is done within the Web browser (and soon in Twitter’s mobile applications). You can select where you are from a list of nearby places. 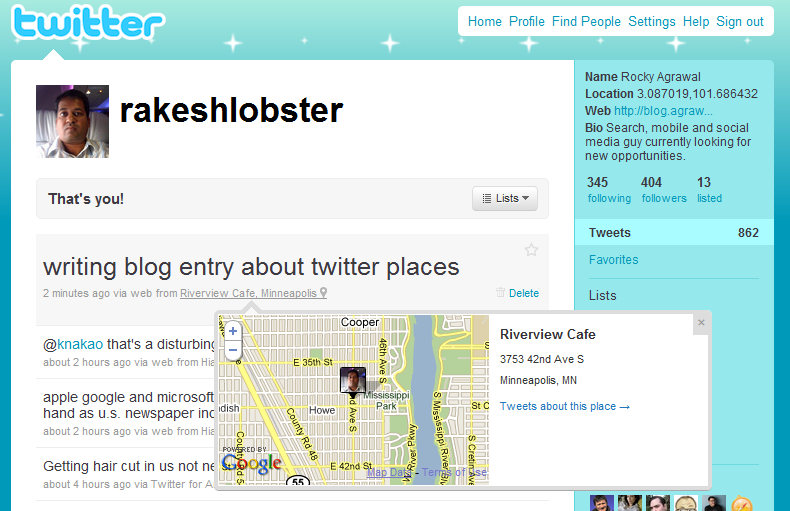 Clicking on the place name brings up the map above and the option to view tweets about that place. Because the place is metadata, it doesn’t count toward the 140 character limit. Place names are human readable, unlike addresses and latitude/longitude. Knowing the name of a place makes it much easier to find than just a street address, especially in dense metropolitan areas. Places are unique to a specific venue. Doing a pure location-based search would return tweets from surrounding businesses or businesses that have since disappeared. Integration in to the main Twitter experience means broad exposure and eventual standardization of place identifiers. That has been a longstanding challenge in the local space. Twitter’s geo APIs have been available for several months and third parties like bing have created interesting applications like Twitter Maps. With the availability of places across the Twitter platform, we can expect to see more interesting applications including both real-time applications (ride sharing and ticket exchanges) and historical (restaurant reviews, past events). Once Twitter allows owners to claim their Place and associate it with a Twitter account, we could see official tweets of announcements and offers incorporated into a Place’s search results. When pictures are tagged to a Place (instead of a lat/long), we’ll have the ability to visually browse a venue in Twitter. This entry was posted in geotagging, gps, lbs, local search, maps, mobile, social networking, twitter and tagged export. Bookmark the permalink.